Back in 2009, the Orlando Magic put on a show in the Eastern conference as they destroyed any opponent in their path on their way to their first NBA finals appearance since the Shaq era in Orlando. This was impressive to say the least as this team has flown relatively under the radar for the past couple of seasons without having many great expectations due to teams like the Detroit Pistons, Cleveland Cavaliers and Boston Celtics having great success throughout this decade. With these teams gracing the headlines on a daily basis out of the Eastern Conference, the Magic slowly, but surely became one of the best teams in the NBA. Sometimes though, being able to fly underneath the radar is one of the best things that can happen to an NBA franchise as the pressure is off and every accomplishment is thought to huge. Even though the Orlando Magic were able to make it all the ways the NBA finals last season against the eventual NBA champion Los Angeles Lakers, a few changes were made in the off-season in order to counter teams like the Cleveland Cavaliers and Los Angeles Lakers moving forward. Another reason for the big trade they made in the off-season for Vince Carter was because there go to guy in clutch situations decided to take the high road through free agency. 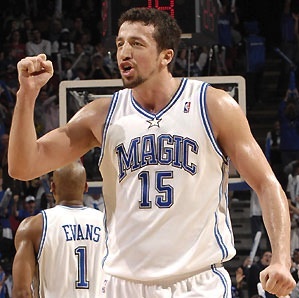 During the NBA playoffs and NBA Finals in 2009, the Orlando Magic saw Hedo Turkoglu emerge as the player to put the team on his back and hit the clutch shot in late game situations. Even though Turkoglu became a huge part of the offense, he couldn’t help lead this team to an NBA title over an obviously better opponent in the Los Angeles Lakers. Even though he didn’t get a title for his impressive postseason performances, Turkoglu greatly improved his asking price in free agency and was pursued by many teams in the offseason. The two teams that were desperately trying to add Turkoglu into the mix was the Portland Trail Blazers and the Toronto Raptors. In the beginning, the Blazers seemed to have a done deal in place to acquire the sharp shooter, but the deal fell through and the Raptors took advantage by signing him and finally getting a great player to play alongside their All-Star in forward Chris Bosh. Unfortunately, Turkoglu failed to live up to expectations and now the Toronto Raptors are seriously considering trading him away this summer. Not only do the Raptors want to get rid of the free agent bust of sorts, but Turkoglu is also very open to a trade that would send him elsewhere as he feels he made a mistakes signing with Toronto. Ironically enough, the one team that seems most interested in a trade for Hedo Turkoglu is the Sacramento Kings where the sharp shooter started his career alongside Chris Webber and Mike Bibby. This would be perfect place for him to land as he would be great fit and help the development of the young players like reigning Rookie of the Year Tyreke Evans.